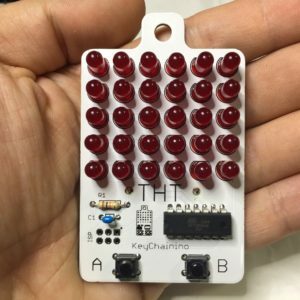 I have had a problem making a simple sketch to KeyChainino. 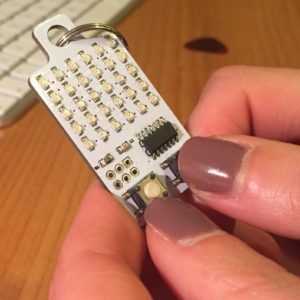 The problem was that if I put the code below on the basic sketch to just blinking one LED of the matrix, the LED only turns OFF and never goes ON. It’s very strange because I don’t nothing different compared to the other games sketches. Looking forward on this problem I discovered that the problem was the interrupt used for Charlieplexing matrix. Probably, when I set a bit of the matrixState and an interrupt occurs, the microcontroller doesn’t set that bit. The instruction is truncated. This solution works perfectly. So I made two function in order to set and clear a single bit on the matrixState. So I added these functions on all KeyChainino’s sketches. If you want to know something more, please leave a comment below.